Think about Ladakh and the first thing that pops in minds of many is perhaps the leather jacket clad bikers riding through the serene and heavenly roads. But no matter who you are, a biker, a traveler, photographer or even a movie buff (who often catches the glimpse of Ladakh in movies) if the word ‘adventure’ gushes the adrenaline in your veins then Leh-Ladakh is definitely the place you wouldn’t want to miss. Housed in the Indian state of beautiful Jammu and Kashmir, Ladakh is the highest plateau in the state which has range of surprises to offer, from stark mountains, to monasteries, lakes and not to miss the Tibetan food and culture. Leh is the largest town in Ladakh and has much more to offer than one can imagine. I must warn that traveling to Leh isn't really a piece of cake, it does have its own challenges be it the accessibility to the place, weather or mountainous terrain. 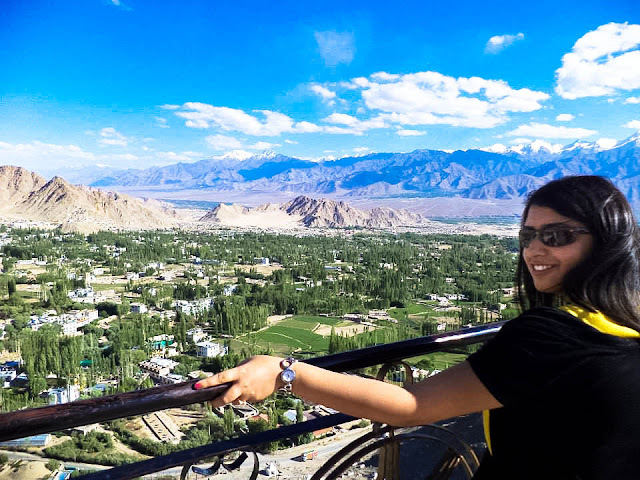 The easiest way to travel is by air from Delhi (yes, I kept it simple), although if you want to experience an exciting crusade before reaching Leh then traveling by road either by bus or by bike or even by train provides an incredible view of the landscape as an incentive. 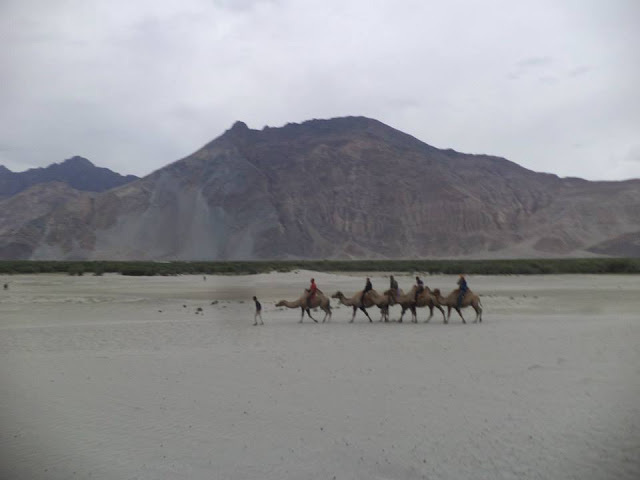 There is so much to explore in Leh that one must be prepared for an extensive trip to capture the scenic beauty of this relatively less explored land on your camera. But before you start exploring don’t forget to acclimatize yourself to the atypical weather. Here are some places I managed to travel while in Leh and it still lingers fresh in my memories. Built in 1991 by Buddhists from Japan and Ladakh, one not only finds spiritual solace under the shade of peaceful Buddha statue enshrined by 14th Dalai Lama, but can also get a good Panoramic view of the valley. This place provides one of the world’s best sunrise and sunset views. A must-go place for photographers and nature lovers. A humongous structure that takes you back to 17th century royal living. 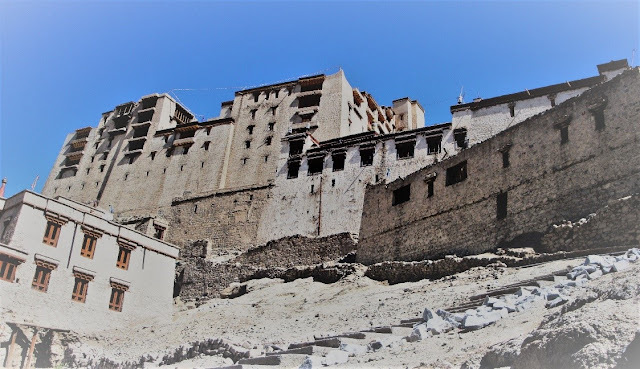 Seeking inspiration from Potala palace in Lhasa (Tibet) this awe-inspiring palace is whopping nine storey high which seems to have held royal family in higher floors, while housing stables and store rooms in lower floors. Although in dilapidated state now, this place is sure to take you back to ancient times. Explore more of Ladakh Highways and Palaces. 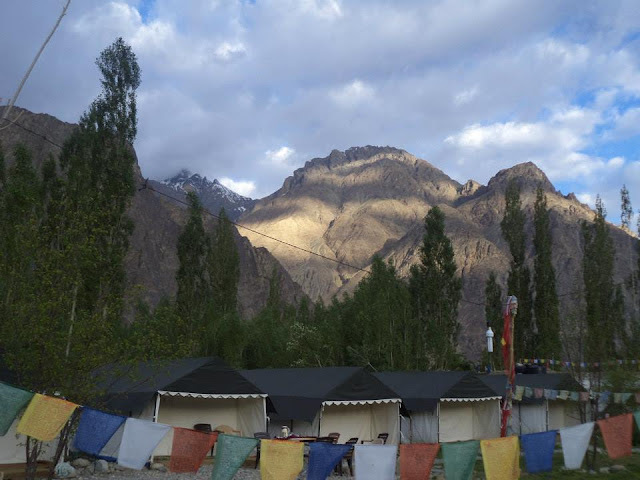 Check out this Ladakh Holiday Package for 9 nights on Tripshelf! Also, called victory tower is placed on the same hill (Namgyal hill) as Leh palace. It was built to celebrate the victory of Ladakh over Balti Kashmir Army in 16th century. This structure is visible from virtually any place in Leh. 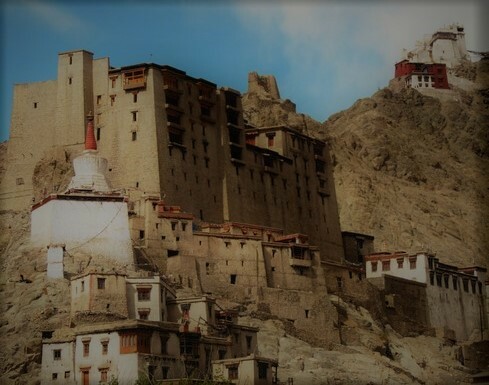 Placed beneath the fort is this 15th century monastery called Namgyal Tsemo Gompa that consists of a three storey high Buddha image along with many ancient manuscripts. 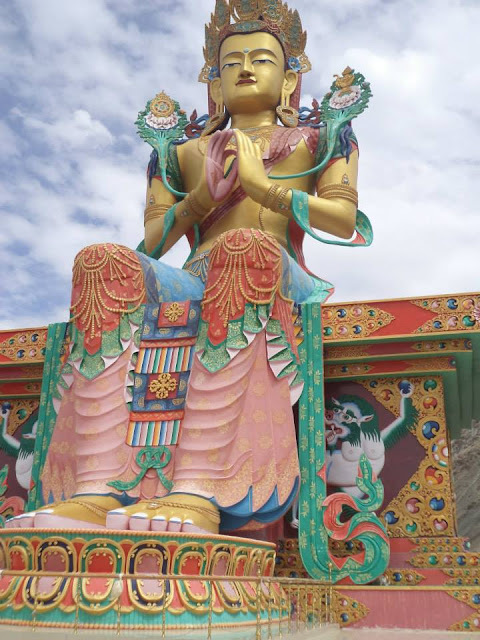 Located less than 20km away from Leh it is housed at the top of a hill in Thiksey village and has one of the most beautiful and colossal Buddha statues in Ladakh placed in Maitreya temple which stands 49 feet tall. Built in 15th century this twelve storey complex houses many stupas, thangkas, murals, swords etc. Being the largest monastery, it is also considered to be one of the wealthiest monasteries of Ladakh. 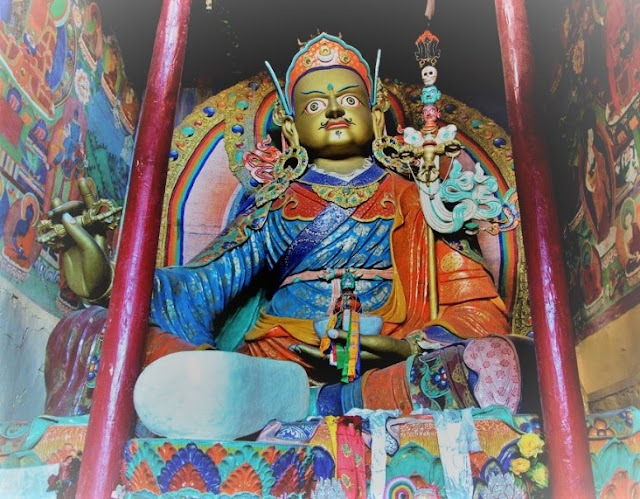 Renovated in 17th century by king Namgyal Sengge this Gompa belongs to Dugpa order worshipping the Buddha Padmasambhava. The monastery is full of colourful murals and sculptures. 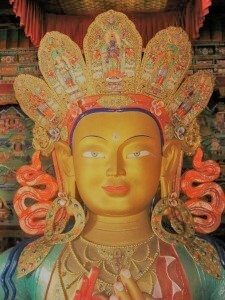 The huge idol of the Buddha is one of a kind. 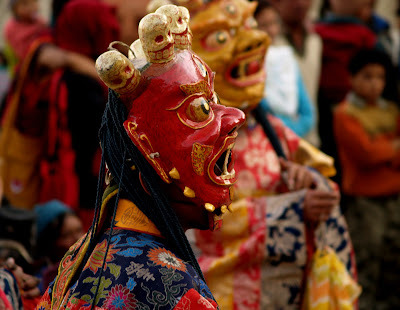 I was lucky to witness the vibrant Hemis festival held every June honouring the deity. The vibrant outfits, attractive masks, beautiful tunes, and dance is once in a life time experience. Adventurous enough to ride over Ladakh highways? 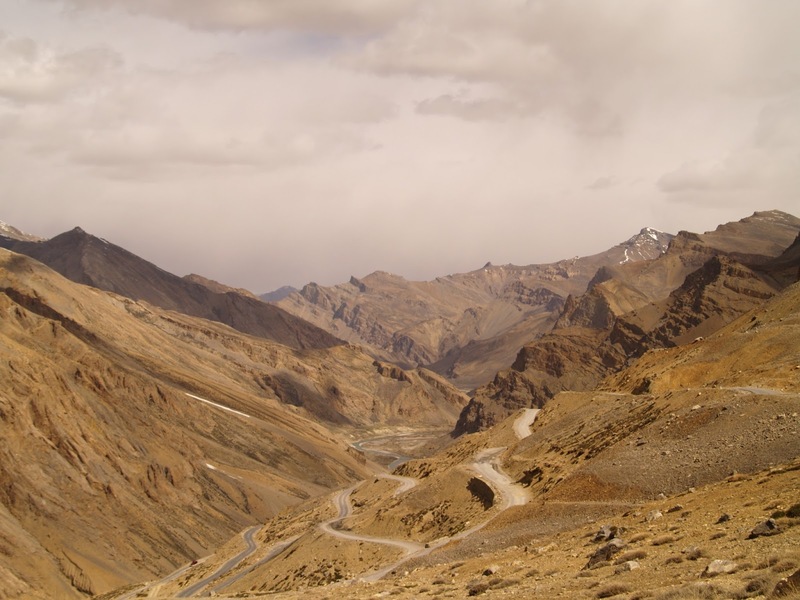 Here is a thrilling bike package to Ladakh, ride your way through it! Remember Phunsuk Wangudo (Aamir Khan) flying a drone with ladakhi kids near a lake in movie ‘3 idiots’? Yes, that beautiful lake is what I am talking about. The journey from Leh to this lake takes about 5 hours and one needs to start early as there are many passes to be crossed in between. There is a strange yet beautiful stream that flows near lukung called Pagal nala which needs to be crossed before 12 noon as it becomes unassailable after that. It takes a whole day to visit this place, but the moment one catches the glimpse of this heavenly lake, some sort of renewed energy starts to radiate in the air. This place is worth a visit in all human existence. Although, there is no permit required for Indians it is best to carry an identity proof anyway. 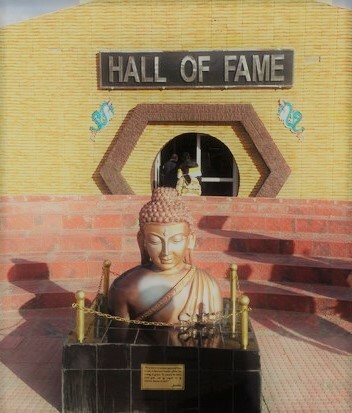 If your heart goes out to those Brave soldiers who stand tall in the most extreme conditions in the world to provide peace in our country then this ‘Hall of fame' is a must visit. Located in airport road, this museum brings us closer to the lives of soldiers in most treacherous glaciers like Siachin along with other information on people and culture of Ladakh. Go to Ladakh and not shop would be a real waste of trip. Ladakh is popular for things like silver jewellery, torquiose jewellery usually worn by Ladakhi women, Thangka paintings on silk, prayer wheels, carpets, stoles, rugs, and woolen clothes. Head to main bazaar which offers umpteen number of stores to chose from. But be prepared about the prices as most shops have fixed price some more expensive than others. 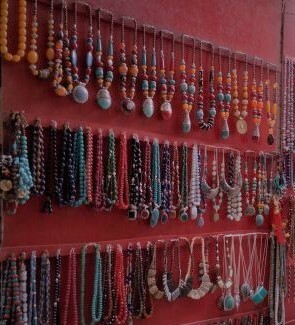 For a good bargain try visiting Moti market or Tibetan refugee market on old Leh road. Government run emporium could also be a good place to buy handicrafts, but they are little pricey. Ladakh is a synonym of adventure in more ways than one. One can try many adventure sports like trekking, river rafting, mountaineering or less adventurous yet enjoyable sports like polo or archery. I tried my hands-on river rafting and trust me I would want to go back to Leh again not just for the sport, but for the unforgettable views I experienced while rafting. The picturesque views of hill top monasteries and trail of magnificent landscape had left a lasting impression for life. There are several packages to rafting ranging from level I to IV, all with either just rafting service or lunch/transport along with rafting, take your pick. 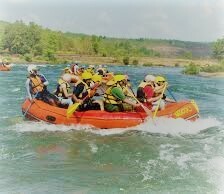 Best time to raft is between June to August when the water level is high enough. 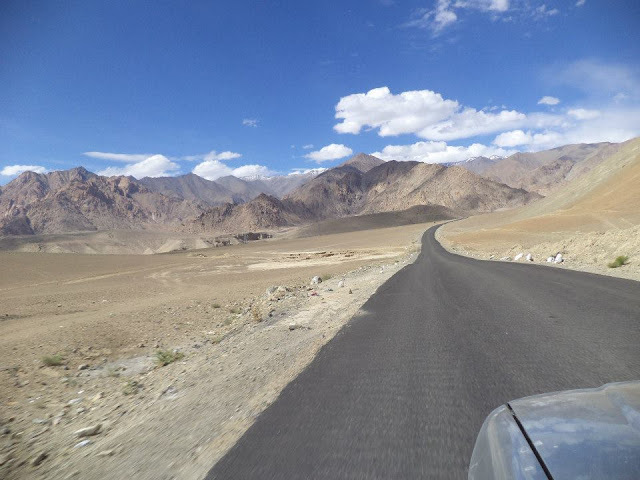 Grab this self drive holiday package to Ladakh for 11 nights, o n Tripshelf! Be a Ladakhi when in Ladakh. Although, Leh being a tourist place provides a range of options to satisfy our tastebuds from usual Indian to continental delicacies, I think the best bet is to try Ladakhi cuisine for authentic taste and flavours which is pretty much different from what we experience in our cities. 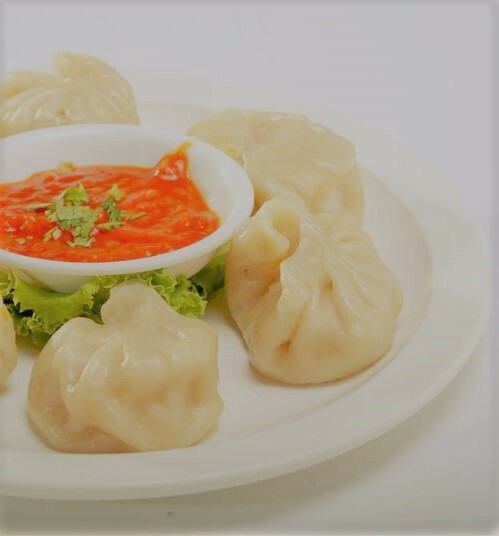 Try Ladakhi bread called Khambir with butter tea or apricot jam for breakfast followed by noodle soup thenthuk or Ladakhi traditional meal skyu for lunch and steamed dumpling momos and noodle soup thupka for light dinner. Take the taste of Ladakh with you and savour it forever. Traveling through the vast grim belts of valley with alien climate and yet with breath-taking views is something that cannot be expressed in words, but can only be experienced best. So, go ahead and live the adventure of a lifetime. Spectacular, enthralling, epic. Words fall short when it comes to describing a trip to the land of high passes – Ladakh. Just like everyone else, a trip to Ladakh found its way to my bucket list and I am glad it did. Located in the northern most state, Jammu & Kashmir, Ladakh is truly the crown jewel of India. Majestic mountains, high passes, meandering rivers, placid lakes, enchanting desert and the humbling monasteries, the place has it all. For an adventure junkie a trip to Leh ladakh can truly be the trip of a lifetime. Driving on treacherous terrains crossing some of the world’s highest passes makes for a thrilling experience like none other. 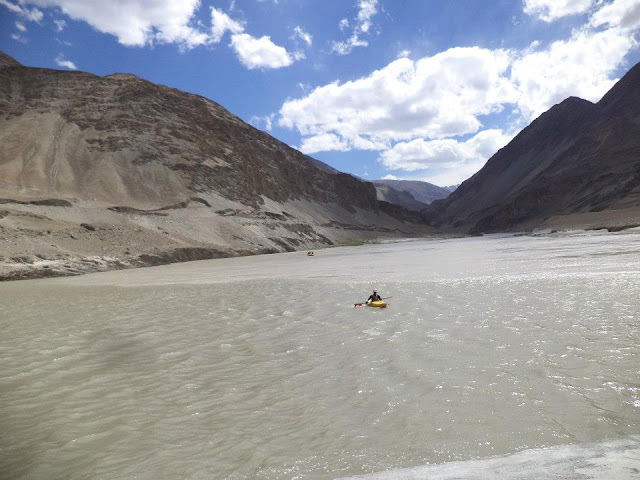 But that is not all, rafting in the mighty Indus and Zanskar rivers or camping in the Nubra valley desert are not any less exciting. The turquoise waters of lake Pangong Tso and the soothing hymns and bells of the monasteries can calm even the most chaotic of minds. I can go on and on but here are my 10 most favorite experiences of the magical trip. 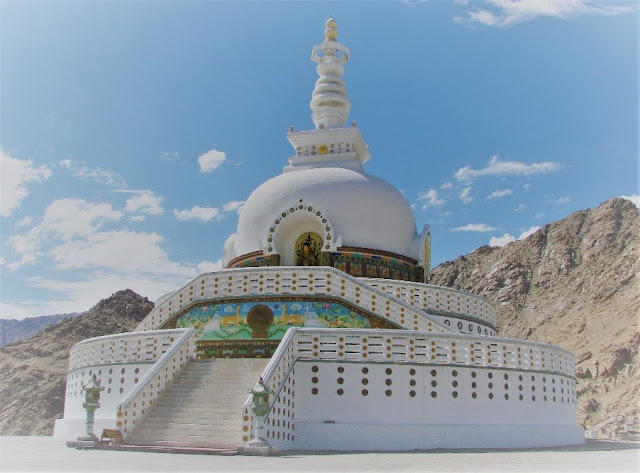 Unless one is driving to Leh from either Shimla or Srinagar, a day is needed to get acclimatized to the high altitude and the perfect way to spend day 1 in Leh is visiting this gorgeous stupa located 10-15 minutes drive away from Leh city. The climb of 500 or so steps got my body ready and set the tone for coming days. Even from a distance the stark white colour of stupa stood out in the brown background of the typical Ladakhi mountainous terrain and once on top, I get the most mesmerizing views of the Leh city and farther areas. As evening set in the golden glow of sun setting on the horizon rewarded us with the most breath-taking views as far as eyes could see. If this was any indication of the days to come, we knew we were in for a great trip. Making way through treacherous meandering roads and various hairpin loops to the highest motorable road in the world, Khardungla Pass was no mean feat and I can easily say that my heart was in my mouth on more than one occasion. It is difficult to spend more than 10-15 minutes here due to high altitude sickness but don’t forget to click the mandatory pictures for your Facebook and Instagram accounts. 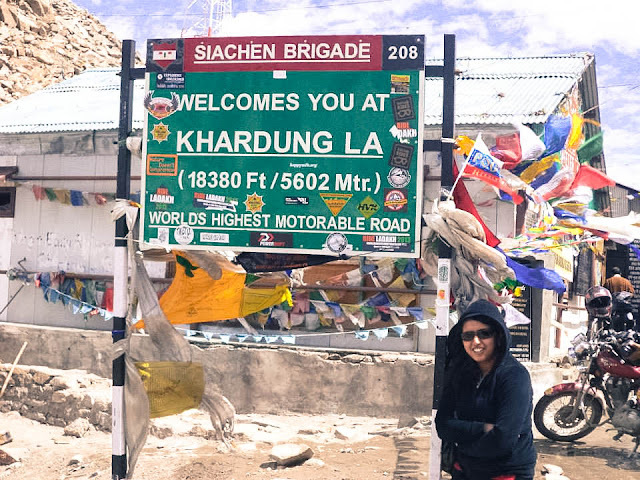 Though it is now claimed that even at an altitude of 5602m, Khardungla may actually not be the highest, but the grandeur of majestic Himalayas and the raw beauty of nature is a humbling experience in itself. It may not be the highest in the world but it’s definitely the highest road I have ever been to! One can’t help but have immense respect for the border roads organization guys who maintain these roads all through the year. Already ready for a Ladakh Adventure? Find out about a perfect Holiday Package to Leh and around here on Tripshelf! What comes to mind when we think about a desert? Scorching sun, heat, sand and camels, right? As usual Ladakh surprises you. Yes there is sun and sand but the temperatures easily reach sub-zero. Welcome to the cold desert of Nubra Valley. A long ride crossing through Khardungla Pass almost 150km north of the town of Leh brings you to this wonder land. One of the most fascinating experiences for me was riding on the back of double humped Bactrian camels. These are a critically endangered species, the ancestors of which were probably abandoned here centuries ago by caravans from central Asia when Nubra valley formed a part of the ancient silk route for traders from south to central Asia. As soon as I saw the cute little tents that were to be our night camps I fell in love with them. But as night set in, I could hear the loud whistling and howling sounds of the wind blowing through the desert. The cute little tent now stirred and swayed with every gush of wind. Even though I woke up perfectly safe to a gorgeous morning, the night at the tent was a thrilling one indeed. 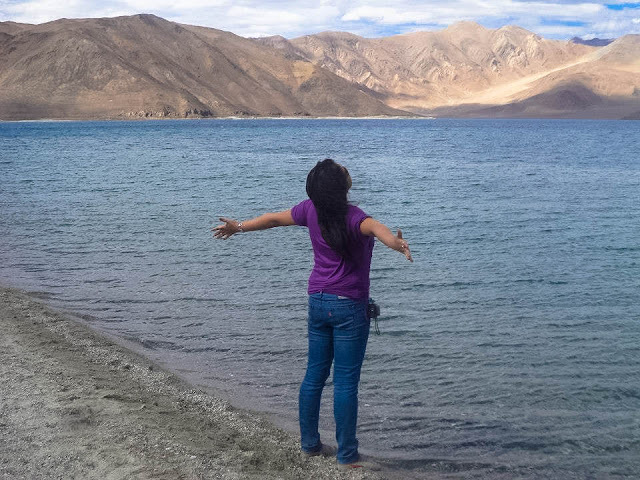 Kareena in 3 Idiots, Anushka in Jab Tak Hai Jaan and countless other actors have shot and been left spell-bound by the beauty of Lake Pangong. The tiredness of a long car ride suddenly disappears as you come across one of the most stunning lakes present all over the world. No need to crowd at the shooting point, walk along the lake and everywhere you are met with divine views. Even though we were supposed to return back same day, we decided to spend the night in one of the tents along the bank of Lake Pangong and I do not regret the decision. As day passed we were greeted with the most exquisite shades of turquoise, blue and green at different times of day. It was probably the most calming and serene day of my life. 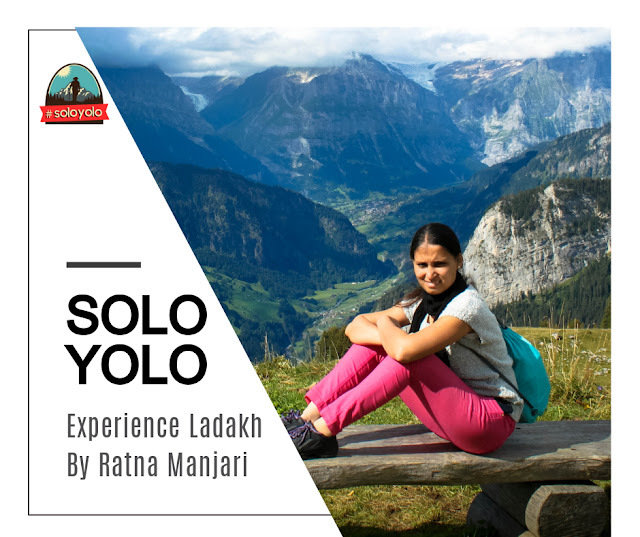 In case you're looking for an all girls trip to Ladakh, don't worry! 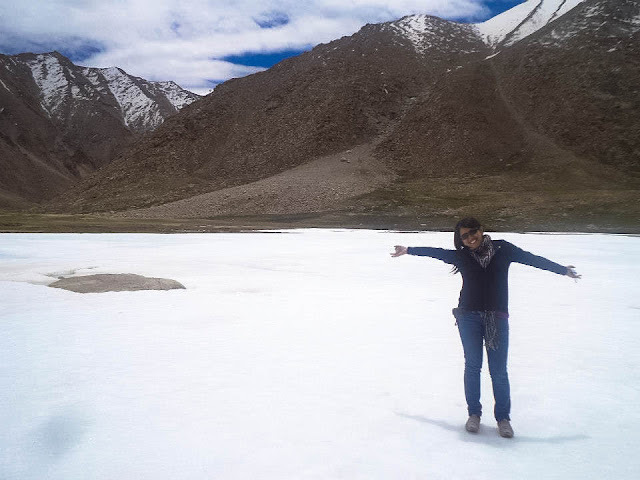 Here's an interesting holiday package to Ladakh: ALL WOMEN'S TRIP TO LADAKH! On our way back from Pangong I was lured by a frozen lake we had crossed on our way earlier. The lake was frozen solid and we followed people who could be seen walking over it. The paucity of crowds is one of the best parts about Ladakh and I found a quiet corner for myself and spend few moments just listening to the silence and appreciating the marvels of Mother Nature. For those who struggle through killing traffic and pollution of Delhi, Mumbai or any other metro, a journey on the epic roads of Ladakh seems straight out of heaven. Clear blue skies, gorgeous vistas and never ending roads, a trip through Ladakh is surely a trip to remember. Blue Zanskar and the greenish Indus, two majestic rivers merge to form one near the town of Nimmu. Since I was there in summers, Zanskar River was more turbulent compared to the placid Indus. I could not help but get excited about rafting opportunity. Four people from my group agreed to come along. Tackling through turgid rapids we thoroughly enjoyed the spectacular landscape with deep gorges and towering mountain peaks around us. You think the mountains, highways and lakes of ladakh calling you? Well then answer them!! 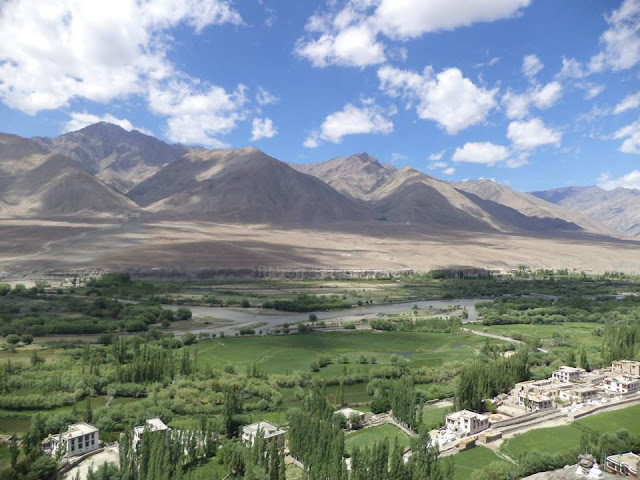 Here's a 6 nights holiday package to Ladakh! Book your flight tickets, NOW! A large number of Buddhist monasteries can be found scattered throughout Ladakh. Not only do they provide captivating views being present at an altitude but also there is some kind of serenity and peace that can be experienced in the monasteries. The soothing hymns and chimes of bells have a power to calm even the most disturbed soul. Whether you are a professional photographer or an amateur, Ladakh provides more than ample photo-ops at every nook and turn. Empty your memory card and carry a spare one. Not doing so is my only regret of the entire trip. Don’t wait, plan a trip because a trip to Leh Ladakh is definitely one of the most fulfilling of all and will leave you with a camera full of photographs and a truck load of memories. 8 things you should definitely do in Meghalaya! Meghalaya, the northeastern town of India, which literally means “the abode of clouds”, makes an enthralling experience for anyone and everyone. From cave hopping to the n number of waterfalls here – there would never be an hour of the day when you will be bored! Here are 8 things you should definitely do in Meghalaya! Meghalaya without a day at Shillong is unimaginable and impossible. The Khasi town and the capital of the state is filled with tourists and the locals. Spend a day here and explore the Police Market to buy the best Korean and Hong Kong imports, go to Shillong peak to relish the view (also, do not forget to dress up in the traditional Khasi outfits!) and try out the local cuisine! It is a well-known fact that Meghalaya is extremely popular for the caves. 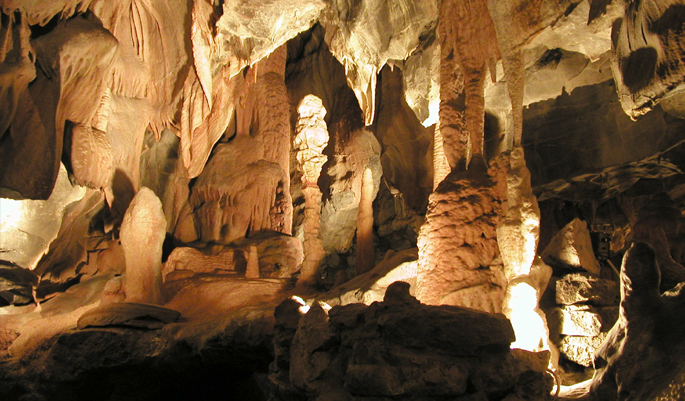 You will find here several explored and even more unexplored cave systems. Meghalaya also houses some of Asia’s longest caves in Asia. During my trip to Meghalaya, I visited the impressive Siju cave in Garo Hills, which is speculated to be more than 3 km long. The entrance was flooded with water and we had to wade through the knee-deep brook in pitch darkness towards the end of the long chamber. The sound of water flowing in the darkness was super scary, but it also added to the adrenaline rush in a weird way. Apart from these, you should also visit Krem Mawkhyrdop, and the biggest sandstone cave in the entire Indian sub-continent – Krem Dam. Meghalaya, a place where there is an ever presence of rain, rain, and more rain, has to have countless and infinite waterfalls. There are the falls, which fall from a magnificent height, to ones that have a broad feature. There is a popular belief among Buddhists that waterfalls are the doorways to other realms. Following the same trail of thought, it is safe to say that Meghalaya is home to infinite realms, which can best be understood and found when you go hopping from one waterfall to the other. There are the famous Elephanta and Noukhalikha falls (this is, in fact, the 3rd highest waterfall in India) to be explored. Apart from that, you will find many others while you set off exploring! Mawlynnong, situated around 100km from Shillong is a magical paradise. It has been granted the prestigious award for being the cleanest village in Asia in 2003. One glimpse of the village, and you will know why! Just go around the village and interact with the locals and if you are lucky, you can also be invited to stay with them for a night. The best way of exploring a place is on foot – and that is what I will suggest you. You can see the Bangladesh border from here too! 5. The wettest place on Earth and it's wonders! You can never be prepared for what Cherrapunjee brings to you besides the rain: The living root bridges. No amount of reading or picture surfing has the ability to replace the exquisite sight that awaits you. The living roots bridge is the finest examples of bio-engineering – it takes 10 years of the Ficus Elastica (Rubber) trees to grow roots and a hundred odd years for them to grow into a strong bridge. Earlier, bamboo bridges were constructed which would either rot or get destroyed in the monsoons, but these living root bridges only get stronger every year! It makes a breathtaking sight and a surreal experience. My advice? Just sit on the roots, and spend some quality time on the bridge. It is a lifetime experience! Meghalaya is as unpredictable as a child. One moment it is all sunny and cool and the next moment it starts raining cats and dogs (& the entire zoo!) Dress comfortably and always carry an umbrella with you. Otherwise, the haywire weather can get on your nerves. However, regardless the situation, a general suggestion is to just enjoy the whims and fancies of the rain god while you are there. Go dance in the rain, trek through it or sip tea and enjoy the view – your call. Just make the most of it! Cutting the long story short: for those who listen, the mountains always call – and there is no turning back. Cheers! If my story has excited you enough to take a trip to the mountains, check out this holiday package of 4 nights, covering the best of Shillong & Guwahati!